This is really just a post to talk about how much I love this particular plant. 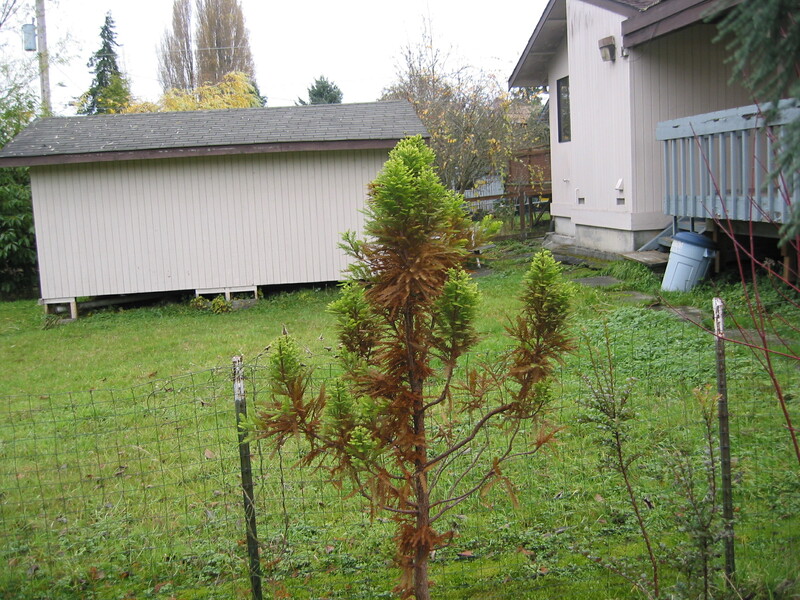 It’s a Dwarf Swamp Cypress, a Taxodium distichum variety from Holland called Peve Minaret, that only grows to about 10 feet tall and 3-5 feet wide, so they say on the tag and on websites. It could get bigger I suppose and it’s growing at a fair pace of about a foot a year for the past 2 1/2 years so far. It’s about 6ft tall now. I planted it in the wettest section of the garden. That’s its feet you see in the Living in a Peat Bog post on here. 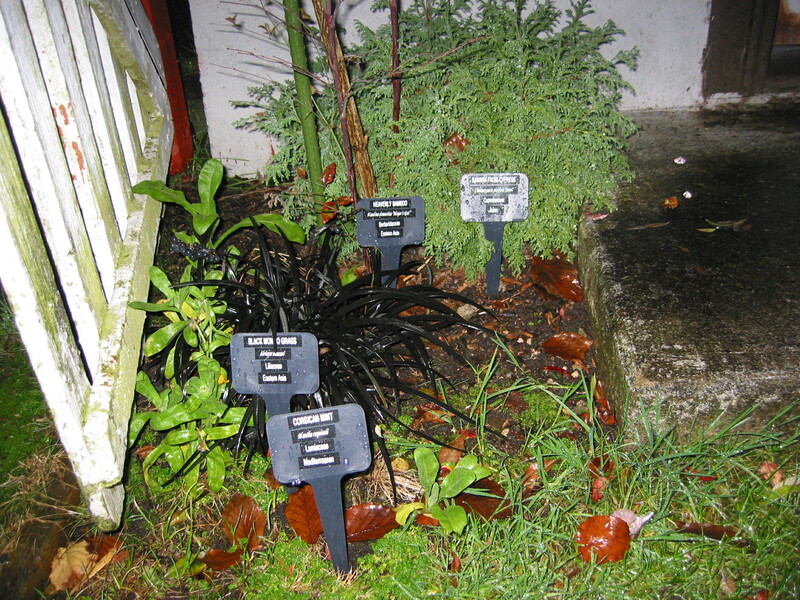 It’s so wet there that there’s literally standing water whenever we get a good rain and I’ve lost a nice Japanese Maple “Bloodgood”, a “Charity” Mahonia and almost lost a beautiful Enkianthus campanulatus Siko Kianus that has fortunately come back after much pruning and tender loving care and planting in a drier spot. I did a lot of research before I bought this little beauty and tried especially to find a conifer that would grow in this wet spot. I found few of them that weren’t huge trees and I really don’t have room for them. I needed a dwarf and I found it in this specimen. It’s a conifer that is unusual because it’s one of only about 3 I know of that are deciduous, unless you count the Ginkgo and there’s some debate about whether it’s really a conifer going on now so I won’t include it at this point, tho I have a dwarf one and would love to include it as another one in my collection. It does lose it’s leaves and right now as you’re seeing it it’s still holding on late into November when most things have dropped all their leaves here, except for the Liquidambers which amaze me with how long they stay in leaf. But this one not only stays in leaf it stays Green for so long it stuns me. It’s still so soft and “petttable”. I chose it as one of my Faves on my website if you care to look at it and read about it some more. In fact I encourage you to look at the website attached to these blogs. It’ll give you a bigger picture of what I’m working with in writing them. OK, enough self promotion for the moment. I read that sometimes these things will actually put on the knees that it’s larger cousins in the swamps put on to get air into the roots and to stay upright in the water. I’m looking forward to the day that the lawn mower catches a knee coming up so we have to start mowing around it. That’d be so cool I think. Anyway I’m so amazed that this tree is still green after so long. But it’s a trade off because it comes into leaf so very late and takes forever to leaf out fully and then to start to grow. It starts at the bottom and works it’s way up and it may not have leaves on it till June. That’s late for here. But it’s all worth it to watch it develop its central leader amidst the number of tops it’s put on. It’s still tying to do that and I’ll let it do its thing as I don’t think it’s safe to prune it as some people do. I don’t believe in topping trees as a rule and that feels too much like that to me so I let it determine its course of growth. I think it knows best how to grow itself into a fine specimen, just like People do…..
I’m just so enamored of it I want the world to know so I gave it its own post. I’ll be doing more of that with some of my favorite plants as time goes on tho as I say several are on the Faves page in the website. I have too many favorites to really choose only a few to highlight but I tried my best. I might mention that in addition to this one I also have a Metasequoia glyptostroboides “Miss Grace” a cultivar of the Dawn Redwood, another deciduous conifer. The other one is the Larch that occurs in places in the high western mountains in the US, in Asia and in Europe. 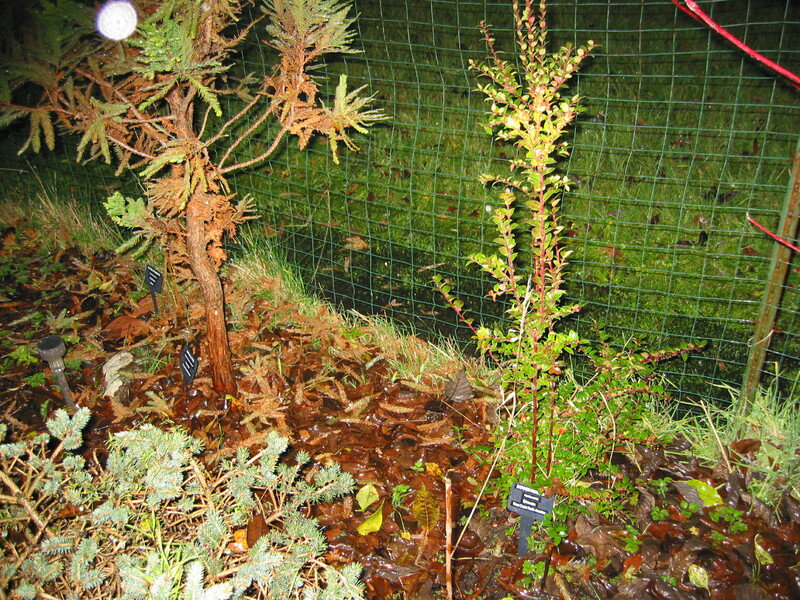 Different species but the same genus, Larix. They’re stunning to see here in Washington where I live and I love driving across the passes in the fall to see them in their bright yellow glory against the darker evergreens. Unfortunately this Taxiodium turns a drab brown when it turns colors and isn’t too exciting but I still love it. The Dawn Redwood turns a deep orange and I have a picture of it on the Faves page in color. If you have a favorite plant that keeps its leaves a long time please do let me know about it. I love things that defy the conventional wisdom of the fall and outlive their usual appointed time to die on us. It gives us a lingering sense of how the garden looked like in its hey days and that’s a nice thing for the plants to do for us. They help us remember before it all goes away for the winter and all we see are bare stems. That’s when the real persistence of greenery comes out with the true evergreen confers and I have a bunch of them. The may be mostly dwarf plants but they still give the feel of a small forest on this small lot and in this little garden. It doesn’t take much for me to be able to imagine what the parent tree must look like in its glory and I do have a couple of full sized conifers that are gonna get big so I’ll have them to look at in the depths of winter. And the shrubs too of course. And that’s enough for now. It’s that time again. Time to put away the hoses and let them drain and wait for the next seasonal hot spells. It’s not that I mind watering, but I also look forward to times when I can let go and relax into the fall and the wet time of the year. You may not think you have to water in Seattle but you do in the summer. It gets dry for some time, always. It’s raining now tho as I write this of course and the garden is flooding in some spots from the amount we’re getting. Not record breaking but plenty to make a mess in places. I actually enjoy the watering I do here. It’s so meditative and gives me a regular chance to see all of the plants in the garden on a frequent basis. I can look at each one as I haul the hoses around thru the various paths and areas of the garden and see up close what needs to be cared for and what’s doing fine. I remember my dad and him watering the garden. 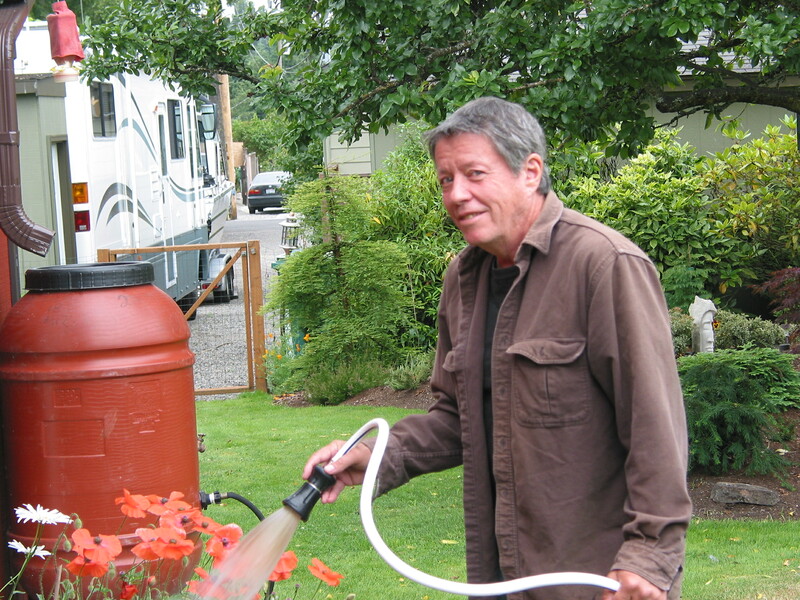 I put in a couple gardens for my folks long ago and made sure to put in fully automatic watering systems. They lived in Central California and needed the system for sure. But there’d always be parts the sprinklers wouldn’t quite cover well enough for his satisfaction so he’d almost always spend some time outdoors late at night meditating and watering. I don’t know what he thought about during those times but it was a space for him to get away from his wife and kids and just to be by himself with the garden he loved so much. I miss him and those times when he’d just hang out doing nothing it seemed yet doing something so important for himself as well as for the garden. I’ll always remember him for that. I find I do something of the same sort myself when I water too. I have it pretty much down even tho I’m inspecting the garden when I do it. But I also can let go and just let my mind float free of my task and let it drift off into space somewhere in the places that are full of moisture and fecundity. I’m a Scorpio, a water sign, so water is special to me, tho I’m deathly afraid of deep water and wouldn’t go swimming in Crater Lake even if it weren’t ice cold. I have a hard time even with ponds that are too murky to see to the bottom. But I love to swim tho I do it rarely. I have asthma and had a hard time learning to do it. I remember classes at the “Y” with great fear and trepidation and was always ridiculed by my peers for being a sissy. Of course I am a sissy, but that’s another story for another post. Anyway I do love to water and I look forward to when I can do it again. But for now I’ll just enjoy this season of moisture and the water that falls freely from the skies. Having lived thru some drought spells I’ve always been grateful for the water I have to use. I try to use it sparingly even tho I don’t have a drought garden. But I do mulch well and try to use as little as possible to keep things healthy. And I do keep the birdbath and fountain full for the birds as much as for myself. It’s lovely to have water around you especially in dry times. I’m so grateful for it and give thanks for it daily. This garden is located in a part of Seattle called Greenwood. It’s an older part of town that once was its own separate community till it was incorporated under the Seattle charter last century. It used to be the terminus of a wonderful street car line that the foolish City Fathers decided to trash some time ago. It’s too bad because now they’re trying to bring in other streetcars in places and light rails and other things that the streetcar would have made unnecessary. Seems like the way it goes in a lot of cities and it’s too bad it happened here. This garden is almost on the edge of the northern boundary of the city now with just one neighborhood separating us from the neighboring community of Shoreline. It’s a quiet part of town with lots of trees and parks and a middle/working class neighborhood feel and a rich diversity of people and ideas developing as time goes on. I won’t say it’s not mostly white bread still cause it is but there are a lot of ethnic minorities and gays and lesbians and other folks moving in in droves and it’s becoming quite the little hot spot. There are several grocery stores and all sorts of restaurants, a post office and a Library all within close walking distance to this home. It’s peaceful here right where the garden is tho being in the middle of a set of blocks bounded by busier streets but this is in a quiet area and doesn’t get much traffic or problems, tho there is the odd stick up or shooting or even a murder here too as there is all over Seattle. It’s a medium sized city and has all the problems of a place its size. And Greenwood isn’t immune to them. But here in the heart of Greenwood is this precious little Wildlife Sanctuary on a small city lot. It’s an easy thing to do. You just register with the Dept. 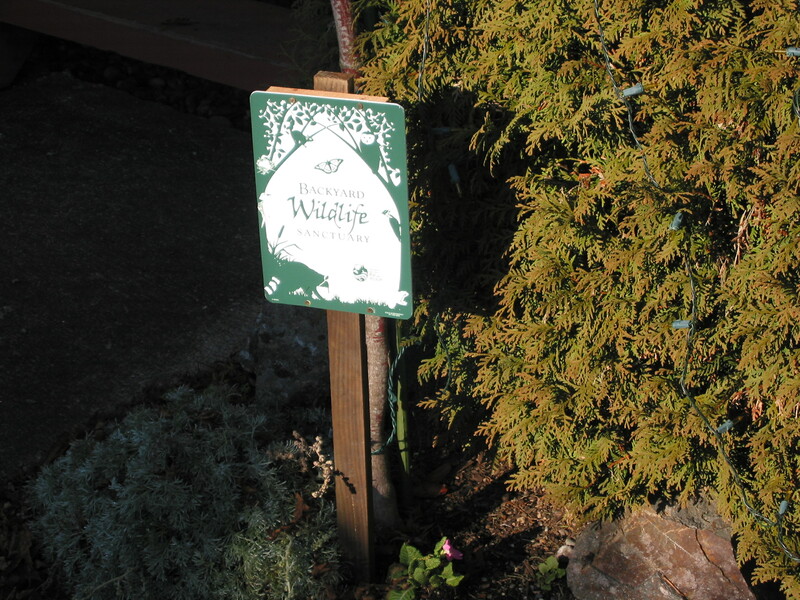 of Fish and Wildlife and send them $5 and a form they have you fill out with your plant list and a list of animals and birds that visit you and you get this nifty yard sign above and a placard to hang on your wall like I did. It’s very cool and I wish more people would take the time to do it and have more of these Sanctuaries around town. They’re unique little islands of calm and an oasis for the birds especially. Greenwood is a perfect place to have one too. As I look out at the garden today I see big puddles of the rain that’s been coming down for the past few days and shows no signs of quitting. In fact it’s supposed to get stronger. This place is in the Piper’s Creek watershed and there are many places the creek pokes up thru the gardens of the neighbors but for this garden it just shows up when it rains too much and the water fills in areas. I’ve had to redo the whole north side of the garden with special plants like the swamp cypress and a creek dogwood to allow there to be plants that can not only withstand the water but actually thrive it it. I did a lot of research before I replanted the ones that died before from the water build up. Plus there’s the neighbor’s overflow since they don’t have a gutter so it all comes down in this yard. Totally unfair, but what can ya do? A Joke around the house is that once a piece of tin foil blew off the Bar b Que and flew into the garden and fell onto the peaty soil and within a few weeks there was a ten foot flagpole growing there! Just kidding but that’s about true because I’ve been amazed at how fast some of the plants I’ve put in have grown. Realize that this whole garden, except for the upper story and background plantings, is only 3 years old and I started with some small plants for the most part for the cost and because I’ve found that usually a 1 or 2 gallon plant will catch up with a 5 gallon one in a few years. I’ve splurged on occasion for some special plants and gotten big ones but mostly they’ve been small and the peat provided such a rich medium for growth that they do well. I also believe strongly in mulching and I’ve used a fertile mulch from one of the local nurseries made from composted manure and sawdust that works so well it’s incredible. It absorbs the water and allows me to mound up areas with soil and mulch for a textured look to give some form and definition to the garden as a whole. Once when a gate was being put in the hole that was dug hit water at 2 feet and tho this was in the spring it’s true it’s indicative of what it’s like here. A previous owner of the place once stuck a 20 foot piece of rebar into the ground by hand and drove it all the way in and never struck hardpan or bedrock. The neighbor had to put in equally deep footings to build their house and at one point a piece of earth moving equipment they were using tipped over and almost fell on this house and it took a couple of Big tow trucks to get it back safely on the ground. It’s funny tho because the neighbor across the street has clay and a totally different soil mix. So I guess the Peat flows in rivers or channels thru the neighborhood and it’s just lucky that the garden here is in one of those channels. I haven’t yet found any evidence of previous inhabitants in the peat like they do in the UK in places, but I wouldn’t be surprised I guess. Maybe someday I’ll unearth a treasure. Time will tell as we garden here in the Peat. 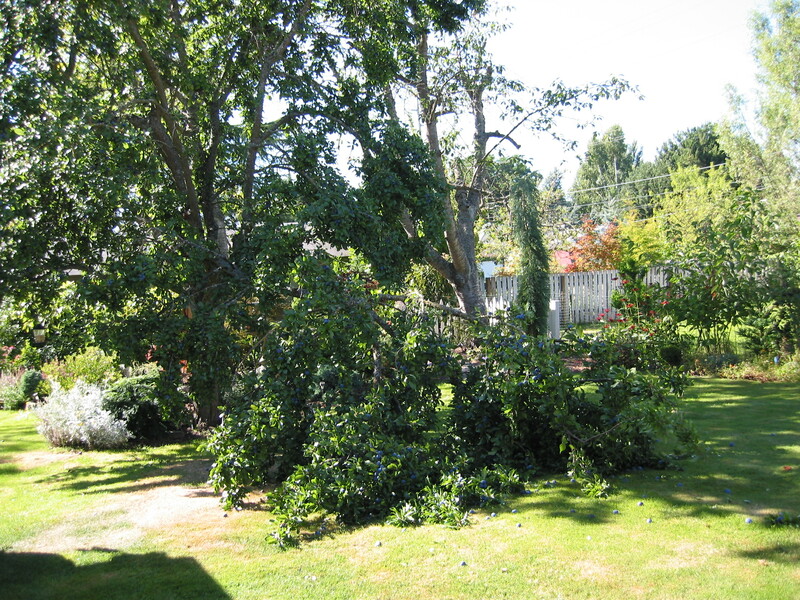 There are a lot of aspects to maintaining a good garden. And one of them is pruning. Another is choosing the right size plant to fit where they belong. I have some opinions about this which I’ll talk about a bit here. I’m talking about the way I’ve done things in my landscaping businesses and nurseries I’ve worked in for over 20 years as well as my own gardens for longer than that. I don’t say this is the only way to do things but it’s what I’ve come to believe works best. It’s how I approach my own garden. I have to be creative in my pruning methods but that’s ok. 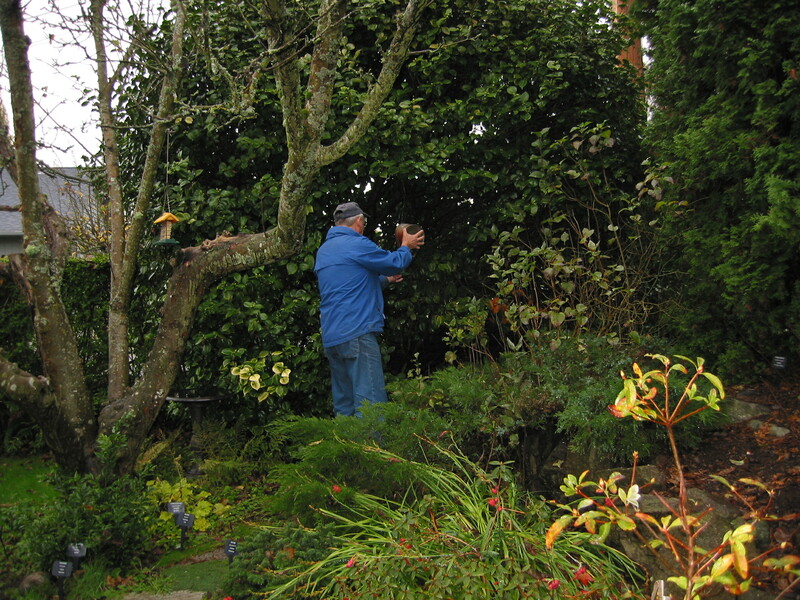 I love to prune and learned from a man who taught me to do “aesthetic and therapeutic’ pruning so that the plant remains healthy but its artistic elements are also encouraged and so it would fit in place with its neighbors in harmony. I try to do that with all my garden work. I believe that plants, and people, do best when they are allowed to grow to be themselves. So in my garden design businesses I always tried to allow for the eventual size and shape of a plant to be allowed for in the design. I have a theory that the reason many people don’t like some plants is simply that they were planted in the wrong spots and thus required too much work. If a plant had been put there that matured to the right size it might never have been a problem. Anyway I’ve tried my best to follow this in my own garden but I admit my collector’s eye has gotten me into some tight spaces here and there and I’ll have to be very careful as to how I grow this garden at times. That’s ok tho as it gives me something exciting to do and work to accomplish for many years as I live and grow with this garden. And remember: Stop Topping Trees! ( slogan courtesy of Plant Amnesty, of which I am a member. It’s an organization that advocates for proper pruning and other fine things.) It may have its place in an orchard but rarely in a good garden. Be careful. Would You want Your head and limbs cut off willy nilly? Think about it. There’s almost always a better way.